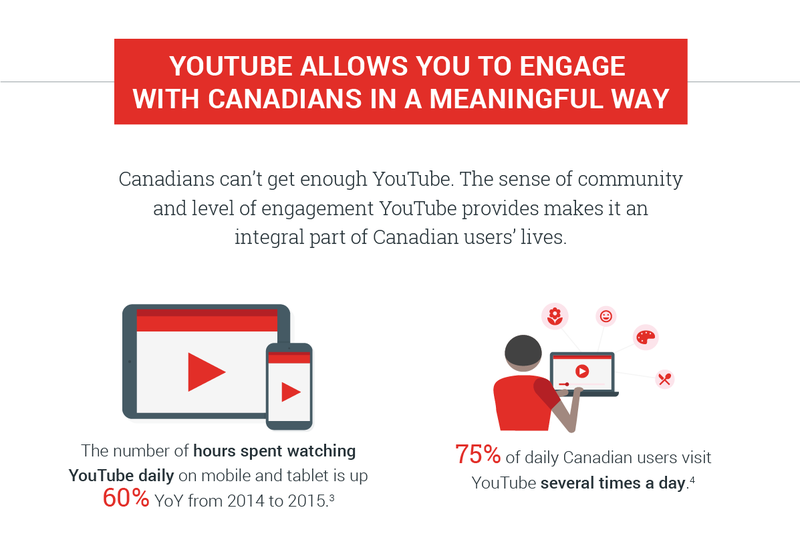 Canadians of all ages and demographics turn to YouTube to engage, be entertained, and to better understand their world. Brands that harness the storytelling capabilities of YouTube can reach and engage consumers—and truly break through. 1 eMarketer, "Digital Video and TV Viewer Metrics in Canada," 2012–2017; year comparison 2012–2016. 2 PHD, "CMUST Study," Canada, 2015; online video defined as ivideo. 3 YouTube internal data, Canada, Jan–Dec 2015 over Jan–Dec 2014. 4 Google/TNS, "YouTube Audience Profiling Study," Jun 2016, Canada, n=442. 5 Google/Ipsos, "Human Stories Canada," Jun 2016, millennials, n=1364. 6 Google/Ipsos, "Human Stories Canada," Jun 2016, n=1349. 7 Google/Ipsos, "Human Stories Canada," June 2016, n=754 (TV), n=1112 (YouTube). 8 comScore, "Video Metrix," Canada, May 2016, desktop only, ages 35–54. 9 Google/Ipsos, "Human Stories Canada," June 2016, n=2764. 10 Google/Ipsos, "Human Stories Canada," June 2016, n=2435. 11 Google/Ipsos, "TrueView and TV Lab Test," Canada, 2016; base=control cell paid views (n=429), paid views plus TV test cell (n=192), control cell (n=1284), TV test cell (n=300). 12 Google/Data2Decisions, "Canada MMM Study," August 2016.